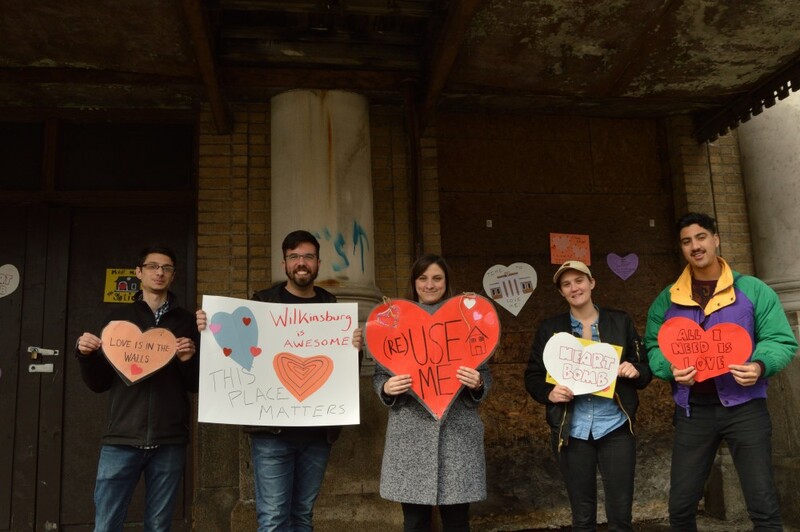 Volunteers with the Young Preservationists Association of Pittsburgh spent the weekend spreading some love to at-risk historic buildings in Wilkinsburg by heart bombing their exteriors with handmade valentines. 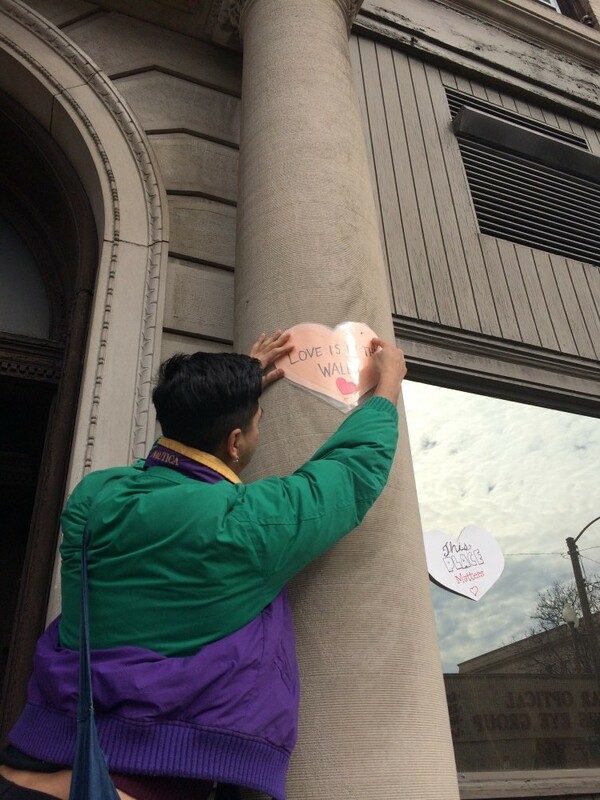 The heart bomb movement began in 2012 with Buffalo’s Young Preservationists and has since spread nationwide as a way to bring attention to overlooked historic structures. Last year, YPA Pittsburgh bombed a trio of local sites including the Old Stone Tavern in the West End, Drover’s Hotel in the Mexican War Streets and the former Allegheny Commons Pedestrian Bridge. This year’s selections included the Lohr Building at 725 Wood St., the Hunter Building at 623 Penn Ave. and the Wilkinsburg Train Station, built in 1916. 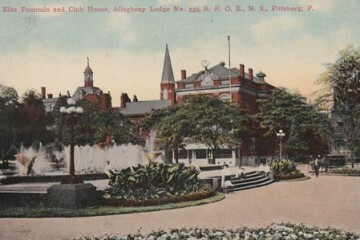 William Prince, chair of YPA Pittsburgh, says the group decided to focus on Wilkinsburg because of the density of historic buildings clustered together in a small space—all three structures are within a few blocks of each other—and also because Wilkinsburg recently lost a historic structure when the Penn-Lincoln Hotel was demolished in 2014. While none of the buildings are in immediate danger of being torn down, Prince notes that the Hunter Building, which currently houses the Wilkinsburg CDC, is listed for sale and the others are in need of significant renovations. 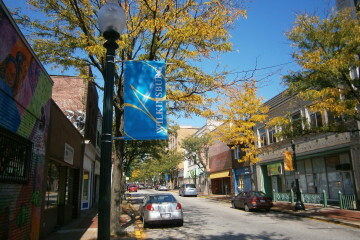 “Initiatives like this recognize our community’s incredible historic building stock, which is one of Wilkinsburg’s strongest assets, while engaging the community in a meaningful experience focused on education and preservation,” says Marlee Gallagher, communications & outreach coordinator at the Wilkinsburg CDC. Not everything that has been heart bombed is in need of new ownership, just some TLC. As we reported in December, the Wilkinsburg Train Station is in the midst of a $3 million renovation that will transform the 9,000-square-foot space into a cafe, arts space and transportation hub. “The Train Station project is a good example of community members and partners working together to restore a neighborhood icon and hopefully spur other interest in an area,” says Prince. Interested in helping to preserve historic structures in Pittsburgh? The YPA will hold a “Saving Sacred Spaces Summit” on March 23 at the Priory Hotel to discuss ways to save and repurpose abandoned area churches and other sacred spaces.